I guess everyone would agree that trips with friends are unforgettable, especially ones during college times. Recently flipping through the college pictures I was reminded of one such trip which left me all nostalgic. So here I am taking you on a long weekend trip to the hills in North-East of India. I would be covering this trip over two posts first of which is to Shillong. We had been bored out of the rigors, or so to say, of the college life and were actively looking for a vent. It was then during one of our post dinner bakars that we realized that we had been there in Guwahati for more than an year and hadn’t ventured out of the city and so were sown the seeds to planning of this trip. Various options were explored and considerations – economic and logistic – led us to decide on a trip to Shillong and Cherrapunji. We began doing the headcount and before we began we already had in our group the usual suspects – Me, Mantri, Chadha and Nishant. However we knew this was not enough and to have a real great time we had to have more and so the discussions began. One thing we knew was more company is only better if it is a good one. And after reaching out to our networks we finalized on the gang – apart from the four of us we would have GS, Kuldeep, Palu, Chandan and Anirudhh with us on the trip making it a group of 10. With this, began the discussion of the next steps. We decided to head out on the weekend of 29th September in 2006. We booked our vehicle and were all set on the day but how could things start without hiccups and so we had our first bump when the driver called that he couldn’t service that day. So frantic calls started at 4 in the morning – time when we were almost about to leave in another 30 minutes – to look for an alternate ride as no one wanted to cancel the plan. Moods were a bit dampened as we all realized that the plan would be curtailed to certain extent as we already had a significant delayed departure. But after some hard attempts we finally had our ride at the hostel gate and we embarked on the expedition. All the glum of delay was overcome by the excitement of awesome 2 days we all looked forward to. As soon as we came out of the hustle of the Guwahati city the cool breeze greeted us. It had rained a bit in last few days and hence that scent of soil from fresh monsoon was intoxicating. As we got out on the highway towards our destination, the scenery all around was picturesque. The hilly terrain with road overcoming ridges and valleys and the view of the slopes flushing in greenery were a welcome break from the routine of the campus life. Guwahati to Shillong is about 100 kilometers and the journey itself seemed to be a glimpse into the awesomeness we were getting into. Including all the frequent breaks we took enroute, it took us about 3 hours to enter Shillong which seemed to welcome us with open arms. Well not really as we encountered our first challenge was to find a roof over our head for the night. We were there in the holiday season with Durga Puja – one of the most important festivals of the region – coinciding with our trip. However after some quick visits to and denial of accommodation at multiple places we finally found our abode for the night – Hotel Pine Borough, where we got hold of big dormitory good enough to accommodate the entire gang. After dropping our bags, we began the exploration of this hill town. Shillong is a beautiful hill town nested beautifully in the lap of Himalayas. It is situated at an altitude of 1496 m above sea level and is capital of the northeastern state of Meghalaya, nicknamed as "Abode of Clouds". 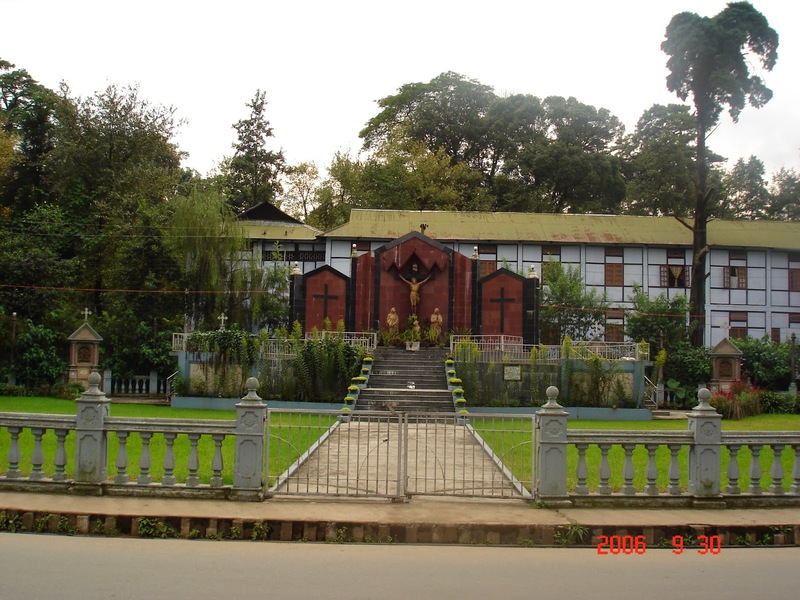 Shillong remained the capital of Assam, before the formation of Meghalaya in the 1972. This city has been the seat of Government since the consolidation of the British administration in this part of India more than a century ago. The place along with a rich combination of its people, climate, flora and fauna create an amiable atmosphere and definitely make this town a worthwhile tourist destination. The town which is home to a number of natural waterfalls is aptly called the Scotland of East. Though I have never been to Scotland yet, but I assume it should be as beautiful as this place to have an honor to nicknaming this eye-catching beauty. Our first destination of the day was the Shillong Peak which is about 10 kilometers from the city. Placing you at a height of 1965 meters the peak offers a panoramic view of entire Shillong and the natural beauty this area is bestowed with. This is the highest point of Meghalaya and tempts one to spend as much time possible here. We were told that the beauty of the view is very different in the evening with the lights of the city coming up and giving an illusion of dwindling lamps from this distance. While we had our chance of having the memories captured in pictures, we still wanted to leverage each possible minute to stay here and so we decided to have a good tea-break to enjoy the view for some more time. Our next stop for the day was the Elephant Falls located about 12 kilometers on the outskirts of the city. This waterfall provides breathtaking view of the water stream descending down in form of two falls successive of each other set in clearances made by fern-covered rocks. Infact we could consider these falls to be made of numerous small falls which make the view all the more beautiful with interesting curvature of the falling water. We also covered a couple of other smaller falls which were equally captivating. One of these were the Sweet Falls, resembling a straight pencil of water emerging from a large size water pipe, as it drops vertically over a distance exceeding two hundred feet. We spent the evening roaming through the streets of the town and spent time around the Police Bazar area which is one of the touristy and busy markets there. The place was bustling with activity and celebrations as it was Dussehra that day – an occasion celebrated as mark of victory of good over evil. Somewhere around that place we had a good meal and went back to the hotel to catch some rest before we move on the busy schedule of the next day. Next morning, we had a quick breakfast at the hotel and left for the day. Initially we had planned to leave for Cherrapunji directly first thing in morning; however our delayed departure from Guwahati pushed one of the spots scheduled for last day. So we covered the Golf Course in the morning. Shillong golf course is located at an altitude of around 5200 ft and is considered first golf course of India with 18 holes in it. The beauty of this supposedly wettest golf course of the world earns it the title of "Gleneagle of the East" by the United States Golf Association and Museum and is like a dream for many putters. Next we visited Cathedral Catholic Church in the heart of the city, which is a beautiful cathedral of Roman Catholics dedicated to Mary Help of Christian. Post this short stop we left this heart touching hill-town for our next destination, Cherrapunji – a tourist destination holding record of being wettest place on earth owing to witnessing heaviest rainfalls in multiple years. I would take you on a lovely journey to this town in a future post, so keep coming back!! Have you been to Shillong? Are you planning a trip? Did you like the article or hate it? Did the prose bore you out? Share all your experiences, queries, appreciation and criticism in the comments below and I would really appreciate all inputs! !